You’ll be seeing many variations of ‘tomato salad’ this week at Simple Kitchen Seasons. 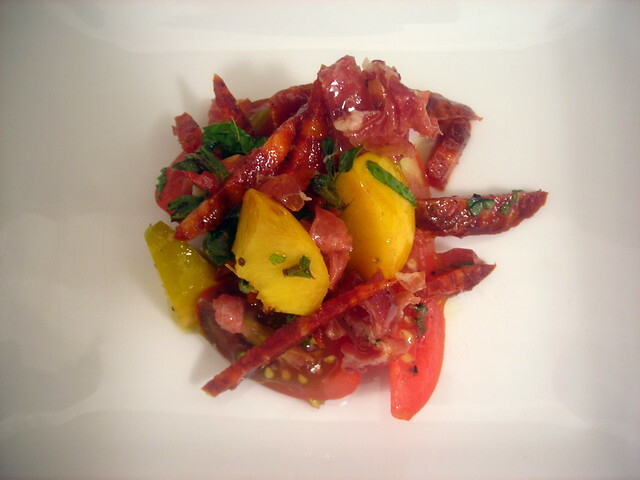 This is a light summer salad that uses two types of tomatoes along with nectarines and plums, chorizo sausage and prosciutto. It’s perfect for an appetizer or salad course. If you’d rather have a vegan version instead, omit the prosciutto and chorizo sausage. Use only the ripest tomatoes and stone fruits in this salad. Your taste buds will thank you. Combine all ingredients in a bowl. Make sure you add the salt and pepper last. Mix well, then spoon onto salad plates and serve at once. If the Sungold cherry tomatoes are tart, you can omit the lemon juice. 1. Substitute plum tomatoes if unavailable. 2. Substitute regular cherry tomatoes if unavailable. 3. Mango nectarines are a hybrid variety of plums, known for their golden yellow flesh and faint mango-like flavor. Regular nectarines are fine. 4. Shiro plums are an heirloom plum variety and extraordinarily sweet and juicy. If unavailable, use regular plums and omit the lemon juice (or adjust to taste). This is my contribution for Souper (Soup, Salad and Sammie) Sundays for the week of August 6, 2012 to August 12, 2012, a weekly foodblogging event organized and hosted by Deb of Kahakai Kitchen. 05 Aug	This entry was published on August 5, 2012 at 11:09 am. It’s filed under American cuisine, food, food photography, Gluten-Free, Souper (Soup, Salad & Sammie ) Sundays, summer and tagged American cuisine, chorizo, food photography, gluten-free, nectarine, plum, salad, Souper Sundays, tomato. Bookmark the permalink. Follow any comments here with the RSS feed for this post. So interesting that you used chorizo and prosciutto! That’s what happens when you have leftovers, LOL. Lots of improvisation goes on in my kitchen. Stick around … there’s an all-tomato dinner that I’m planning for late September. I love homegrown tomatoes so much I do not want to adulterate them into anything other than slice raw tomatoes. Fortunately for you, this week will have lots of ideas you can play around with. That really looks good. Thanks for sharing. Thanks for the comment and for the compliment. OMG!!!! This one has me drooling uncontrollably !!! I had to pin it to keep handy. I love the color in this salad–so pretty and perfect for summer.